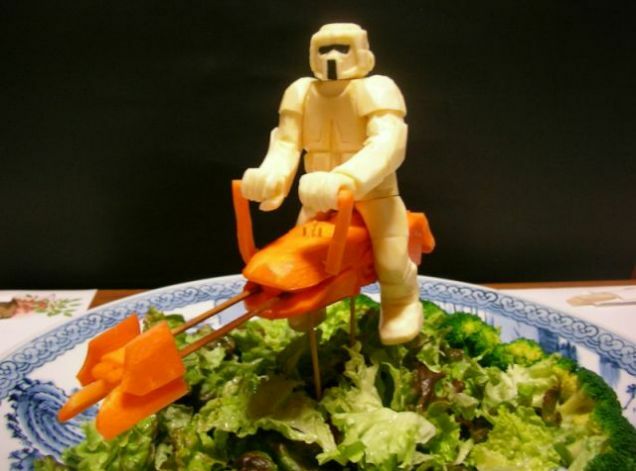 Darth Vader and Luke Skywalker are among the famous faces to be sculpted from everything from carrots to sweet potato – complete with a side serving of the phantom lettuce - by a top sushi chef. 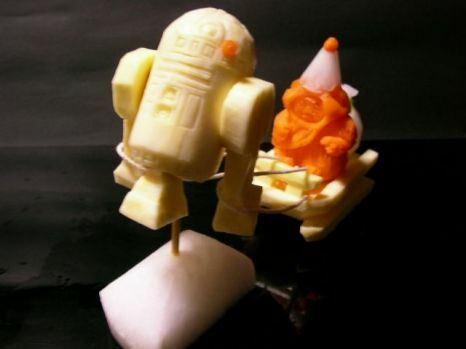 The likes of Yoda, R2D2 and Han Solo are held together with bamboo skewers and toothpicks and feature light sabers and other weapons. They are the brainchild of Japanese sushi chef Okitsugu Kado who spends more than ten hours carving the vegetables before painstakingly piecing them together. 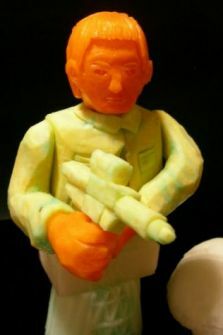 ‘In most cases I place vegetable sculptures on a dish for customers with their food, although with some of the bigger ones occasionally I will only put on display,’ said Mr Kado, from Osaka. ‘I’m a huge Star Wars fan and a member of a Japanese fan group called Jedi Order. 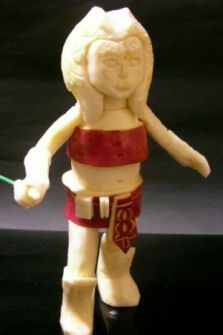 ‘For my carvings I use everything from carrots, white radish, sweet potato, Kyo-potato, radish, even pumpkin and more. 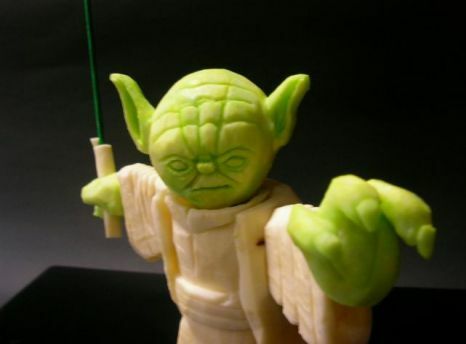 Despite his carvings taking a number of hours, he admits to getting lost in a galaxy far, far away with time passing without him even realising. ‘Sometimes I need over ten hours to finish just one sculpture but it doesn’t matter to me because during carving I forget the time,’ said the 39-year-old, who works at sushi bistro Minayoshi.